Chuvash Institute of Humanities celebrates the publication of the grand work they took part in , the Bible in Chuvash. On April 22 the book was presented to a cheering audience in the Chuvash Drama Theater. The event has had vast coverage in Chuvash media. But its accuracy is doubtful. 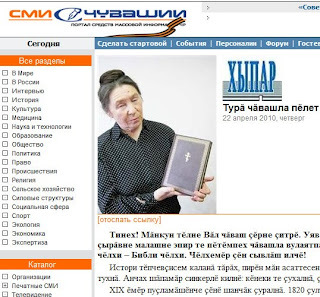 For instance, a pompous report of newspaper Hypar, published to website smi21.ru ran oddly and quite symbolically with an awkwardly flawed picture in which writer and translator Eva Lisina, sister of celebrated poet Gennady Aygi, and one of the most important contributors to the translation, is holding the book and as she's louring from under the brows her blinking eyes are blurred in a demonic looking image. Missteps and oddities surrounding the publication of the Bible leave much room for improvement and hopefully in the future more copies of Chuvash Bible will be issued. While some will be able to enjoy the book others are afraid it will be unavailable to most of the Chuvash people (around 2 million, the overwhelming majority - Christian) as the mere 7000 copies of it won't go into stores but will only be gifted to some people.